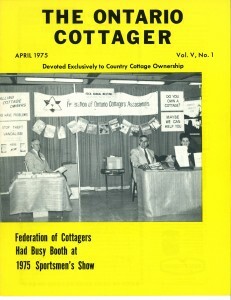 In January 1963, 125 people representing 40 cottage associations met in a Toronto hotel under the banner of FOCA (the Federation of Ontario Cottagers’ Associations) as a provincial organization. Today, FOCA represents 50,000 families in more than 500 associations across the province. The issues have evolved over time, but the motivation remains the same: to protect our waterfronts and freshwater resources for our kids, and for their kids. FOCA was incorporated in 1974. 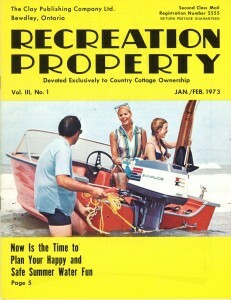 By 1975, the Ontario Minister of Natural Resources, Leo Bernier, wrote in The Ontario Cottager Magazine that, “the importance of ‘cottaging’, as a prime recreational need of the citizens of Ontario, is abundantly clear to us at Queen’s Park.” In 1977, FOCA opened an office in Scarborough and hired its President (Jerry Strickland) as a part-time Executive Director. Today FOCA has 3 full-time staff, a volunteer Board of Directors, and the office is located in Peterborough in the Kawarthas. 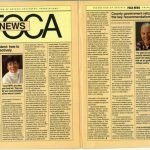 During the 1980’s FOCA fought hard for government action on the issue of acid rain, and lobbied to stop the use of toxic Dombind as a road-dust suppressant. Since then, FOCA has secured the municipal voting rights of waterfront property owners in their cottage ridings, and brought the attention of the Provincial Auditor and the Provincial Ombudsman to the shortcomings of Ontario’s property taxation system. The fight for fair taxation under WRAFT (Waterfront Property Owners After Fair Taxation) now continues under FOCA. For over 30 years, FOCA’s Lake Stewards have been at the core of the Lake Partner Program, the world’s largest freshwater volunteer monitoring program. FOCA has also developed a boating hazard marker program approved by Transport Canada, and put together the most comprehensive risk-management program for volunteers in rural environmental groups, through the FOCA Association Insurance Program. In recent years, FOCA has participated in numerous committees and stakeholder groups, and has spoken out against the federal and provincial omnibus bills that gutted protection for our fisheries and fish habitat. In 2012 we saw resolution in favour of landowners’ rights during claim-staking, after a decade of behind-the-scenes work on the Mining Act by FOCA and others. Over the years, the Federation has published a newsletter to keep its members up to date on its activities. 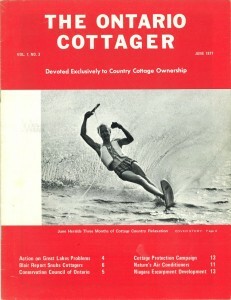 The newsletter gradually evolved into a glossy magazine, The Ontario Cottager … which ceased publication in late 1987 … FOCA has now made an arrangement with Cottage Life magazine to carry the Federation’s news to cottagers … through the FOCA News insert in Cottage Life. 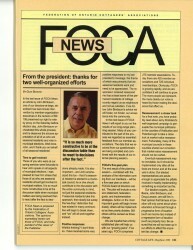 Although a separate entity from the magazine, FOCA News pages remained a fixture of Cottage Life magazine through 2002. 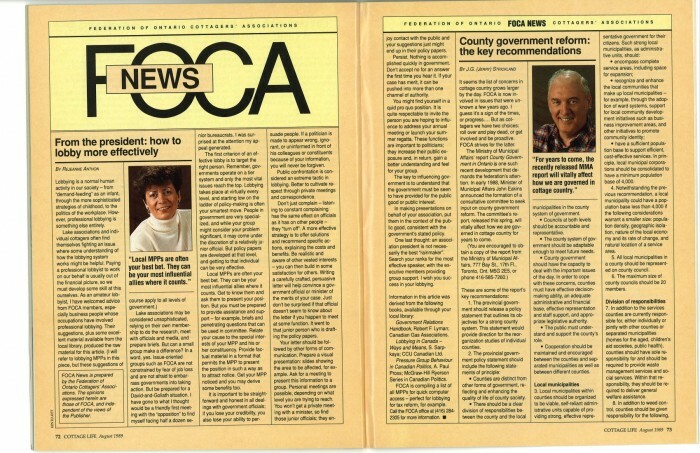 In 2001, FOCA launched its first website and began using a bright new technology, called “email.” FOCA now relies on our website and monthly Elerts (electronic news updates by email) to keep you up-to-date about the issues that matter to waterfront property owners. 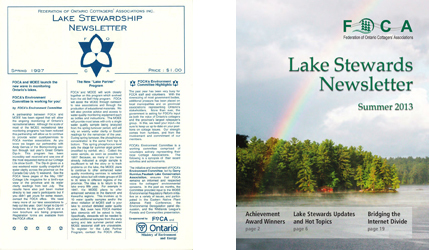 Over the past decade, FOCA has also created the award-winning Lake Planning Handbook for community planning, among other print publications, and has delivered face-to-face stewardship support to landowners across waterfront Ontario, through the Docktalk program. The work continues, and with the support of waterfront property owners and others, FOCA will continue to lead the effort towards a sustainable freshwater future for Ontario.